An 18-chapter introductory Spanish dramatic program produced for Vista Higher Learning. Shot in locations throughout Mexico over the course of 6 weeks, it covers the new friendships and adventures of a U.S. student staying with a Mexican family in Mexico City. Included here is a demo showing the full range of the program, along with a complete episode. This 4-level, 48-episode EFL program for Cambridge University Press teaches English to the world market using an accessible YouTube/home video approach. Various stylistic approaches demonstrated in the program are on-the-street interviews, webcam conversations, how-to videos, video blogs, TV commercials, and animation segments. The engaging and lively segments help viewers explore each unit's topic and target language. This is one segment from Level ? of the program, which was shot entirely on location in Manhattan and Brooklyn. An example of an interview-driven documentary segment approach using colorful B-roll and stills. This segment about globalization was produced for Wiley as one of 24 segments for its video to accompany the ¡Vívelo! textbook. It is the profile of Novica, a successful and popular website that links regional artisans from around the world with a growing online customer base. 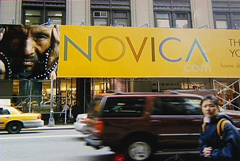 The interviews and tabletop B-roll footage for the segment were shot at the Novica offices in Los Angeles. Examples of recent animation segments we have done using Flash animation for instructional purposes. The first 2 clips here were part of the Four Corners EFL language program for Cambridge University Press. The other was for teaching Spanish grammar to high school students, and is from the ¡Exprésate! video series. A 6-level video program designed to teach English and basic life skills to immigrants in the United States. This program was shot entirely on a soundstage in Boston, and utilized recurring principal and supporting characters and simple and iconic set designs for quick and efficient setting of context and focus on the target language. This is a complete segment from the program. It was shot in HD at a studio here in Boston. Another challenging and successful 3-level secondary Spanish program. All primary location footage for this program was shot in 19 different cities in 8 countries over the course of only 6 months. The program consists of dramatics, vocabulary segments, and cultural segments, and won a 2007 Telly award. This clip is the Level 3 program opener, which uses a reality show "contest" concept that takes place across Mexico for its dramatic design. It has original music we created specially for this program/piece. A retail-oriented video and audio program designed to help adult Hispanic immigrants assimilate into society here in the U.S. This studio-based dramatic video production was shot in HD here in Boston, and includes narrative storyline segments as well as humorous thematic instructional segments. We were also responsible for all DVD and audio CD programming and design production. Currently being sold in major retail outlets throughout the United States. This clip was created to teach tool/hardware vocabulary. An introductory level college French program shot primarily in a house location here in Boston. This clip is the program opener. An ambitious and successful 3-level video series designed to teach Spanish to secondary students in the U.S., with dramatic segments produced and shot on-location in 16 cities in 9 countries over the course of a 9-month period. This multi-faceted program consists of dramatics, vocabulary segments, cultural segments, on-the-street interviews, acquired video realia footage, and grammar animation sequences, and consists of over 10 hours of content. The program won an AEP Distinguished Achievement Award. This clip is a complete VideoNovela segment from a Level 2 chapter of the program. It was shot in Segovia, Spain and San Jose, Costa Rica. 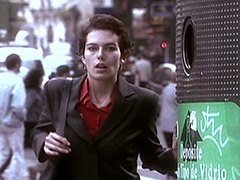 This is the program opener from this mystery video produced and shot in Madrid for the secondary school market. It also won a Telly award.